Learn about the culinary-inspired kitchen features that can turn your kitchen into a chef’s dream. Discover the on-trend features that make a difference to those who love to spend time in their kitchen. Often, in real estate listing write-ups you will see the terms “Chef’s Kitchen”, “Dream Kitchen” or “Gourmet Kitchen”. What exactly constitutes a luxury kitchen? While a chef can cook in any space, a culinary-inspired kitchen space is a highly sought after feature of a luxury home. 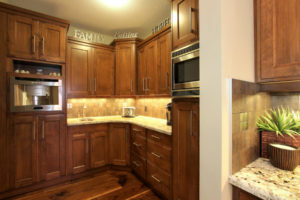 With years of experience working with buyers and sellers of Kelowna luxury homes and estates, Jane would like to share a variety of features found in today’s gourmet kitchens. Chef-inspired kitchens are highly sought after. A beautiful, well-planned kitchen that is rich with useful features becomes the heart of a home. If a truly gourmet kitchen makes the wishlist for your home, here are some of the top kitchen features in today’s luxury homes. If you are looking for a new home, Contact Jane Hoffman Group and we’ll help you find the right home with the perfect kitchen to match your culinary aspirations. Our collection of luxury Kelowna real estate listings feature some of Kelowna’s best kitchen designs. The gourmet kitchen is stunning. 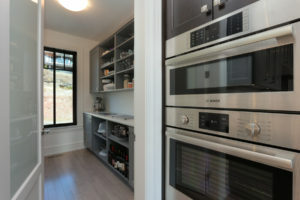 Features include a pantry, Thermador Professional Series appliances, a built-in veggie steamer and cappuccino maker. The spacious and efficient layout, along with the large island, will provide the home chef with a desirable setting for preparing favourite dishes. Gourmet kitchen offers a 10 ft island, quartz countertops, dove-tailed finished custom cabinetry and top of the line appliances and butler’s pantry. The layout and pantry will make cooking and entertaining a dream.